Over the last 15 years verd de gris has delivered a number of successful but small-scale participatory projects with women and girls – many of these projects have been targeted directly to support women dealing with a range of issues affecting their quality of life – depression, social isolation, domestic violence, low self-esteem. What has always amazed us is how important ‘culture’ was as a contributing factor – and something often overlooked by commissioners, support services, health professionals etc. In May 2015, at the beginning of our 3-year Reaching Communities project, we delivered a short, pilot project as part of our Year 1 programme. The aim was to encourage cross-community working with groups of vulnerable women – for the women to draw strength from meeting others from different ethnic / cultural backgrounds. The pilot led to a very successful ‘recovery’ project for local women dealing with poor mental heath and related social issues. This successful model was delivered in Year II. As part of Year III we wanted to continue to develop this model of cohesion and shared learning, and bring on board some new local agencies who work with women ‘in recovery’. We began by developing a campaign to recruit participation from local 3rd-sectors networks and providers. Meetings were set up with women’s support agencies and past project work and methodologies were shared with e.g. social workers and support staff. We were pleased to make contact with a local church support group at The Gathering Place in Halifax, which offers support to a number of very vulnerable women. Cath & Angus Music, who develop project work within The Gathering Place, helped us recruit participants and Sharon from verd de gris ran a number of taster sessions to help reassure the women and build confidence. We complimented this targeted approach with more open recruitment via social media, posters and fliers in cafes, libraries and other public spaces. 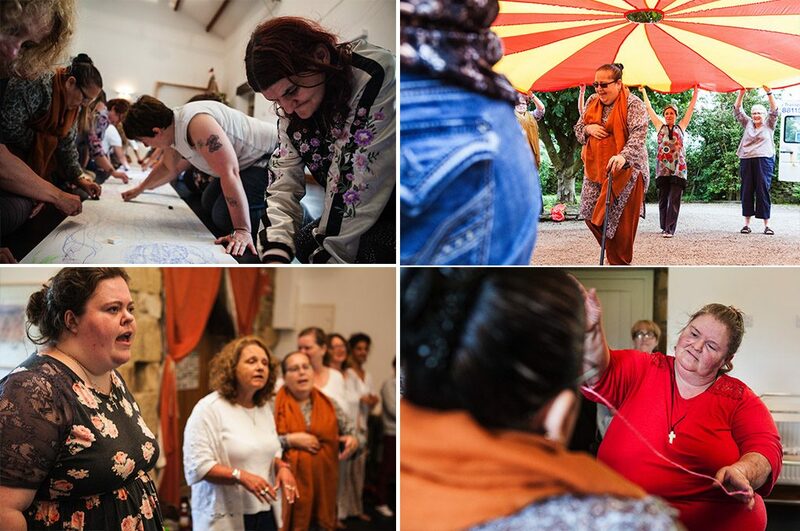 This resulted in a very diverse mix of women coming forward to join us on the creative retreat at Whitestone Arts – women of differing socio-economic, religious, racial and sexual orientation. The two-day workshop at Whitestone was facilitated by artists Sharon Marsden and Natalie Speake, and musician Amy-Rose Atkinson. The aim was to create a neutral yet creative space where every woman could relax and spend quality time without judgement – but also to see a reflection of herself in the other women around her. The project was funded through Big Lottery Fund and part of the Creative Communities initiative with Square Chapel Centre for the Arts.